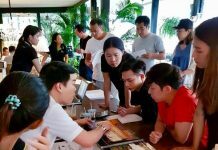 Raimon Land PLC, one of Thailand’s leading high-end urban real estate developers, recently announced the topping-off of The Lofts Ekkamai, the third consecutive development of The Lofts’ series, located in the prime area of Ekkamai, Bangkok. The 28-storey Industrial-chic style project is scheduled for completion in Q3 2016. 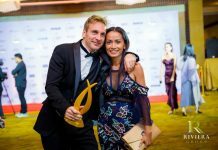 “The Lofts Ekkamai has been well received by both local and international clients, leading to more than 95% sold already, thanks to the simple Loft concept of style, comfort and convenience in a prime urban setting,” said Raimon Land’s Vice President of Marketing and Branding Kipsan Beck. 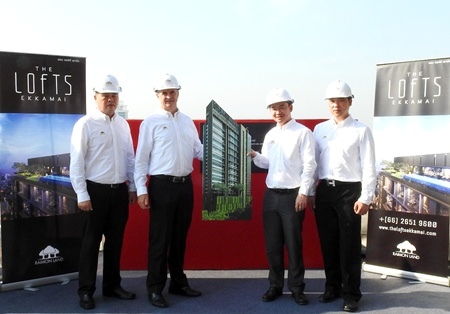 (From left to right) Raimon Land executives Clifford Chan, Manager – Project Commercial; Gerard Healy, Vice President – Development; Sataporn Amornvorapak, Director & Chief Financial Officer; and Chaipat Taechapornwiwat, Deputy Vice President – Construction, pose for a photo during the topping-off ceremony for The Lofts Ekkamai in Bangkok on February 5. To drive additional sales for Ekkamai, Lofts Asoke and all Raimon Land properties in Bangkok and Pattaya, Raimon Land has also launched a promotional campaign “The Sweet Sounds of Music” together with BOSE by Asavasopon and leading banks from 1st February – 31st March 2016. With any unit purchase, customers receive music products from Bose worth 9,900 THB – 49,800 THB, depending on tier spending. Bank of Ayudhya, UOB and Bangkok Bank clients also can enjoy 0% 6 months interest free when paying SPA by credit card. All customers may also receive 1% cash back on-transfer within 12 April 2016. For further details about The Lofts Ekkamai, visit www.theloftsekkamai.com or call 02 651 9600.